Arab Patriotism presents the essential backstory to the formation of the modern nation-state and mass nationalism in the Middle East. 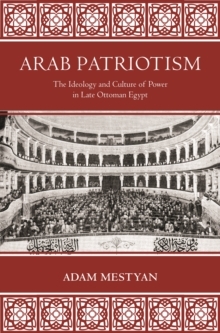 While standard histories claim that the roots of Arab nationalism emerged in opposition to the Ottoman milieu, Adam Mestyan points to the patriotic sentiment that grew in the Egyptian province of the Ottoman Empire during the nineteenth century, arguing that it served as a pivotal way station on the path to the birth of Arab nationhood. Through extensive archival research, Mestyan examines the collusion of various Ottoman elites in creating this nascent sense of national belonging and finds that learned culture played a central role in this development. Mestyan investigates the experience of community during this period, engendered through participation in public rituals and being part of a theater audience. He describes the embodied and textual ways these experiences were produced through urban spaces, poetry, performances, and journals. From the Khedivial Opera House's staging of Verdi's Aida and the first Arabic magazine to the 'Urabi revolution and the restoration of the authority of Ottoman viceroys under British occupation, Mestyan illuminates the cultural dynamics of a regime that served as the precondition for nation-building in the Middle East. A wholly original exploration of Egypt in the context of the Ottoman Empire, Arab Patriotism sheds fresh light on the evolving sense of political belonging in the Arab world. Pages: 368 pages, 12 halftones. 8 tables.